Tour poster coming soon ! HOW COME THERES NO POSTER OR PROMOTION for GAPPY in SYDNEY and MELBOURNE ??? ?Is it true that these GIGS are FREE entry ??? Is the tour still Happening ??? I've been spreading the word, and promoting it on my facebook and radio show, but we're not involved apart from playing a support set on the night... so someone else fi post up the poster and ting! should be a mad show, looking forward big time! De Sydney show is not free btw... $30! But fe any of mi friends mi have $20 tickets. Link mi! Lookin forward! Anyone know melbourne set times? HOW COME THERES NO POSTER OR PROMOTION for GAPPY in SYDNEY and MELBOURNE ???? what time is it kicking off tonight and who else is on the bill? once again another nite of everyting but reggae except for gappy,reggae been hijacked inna sydney, reggae is reggae nah bomba claat hip hop and house/ dance rubbish. 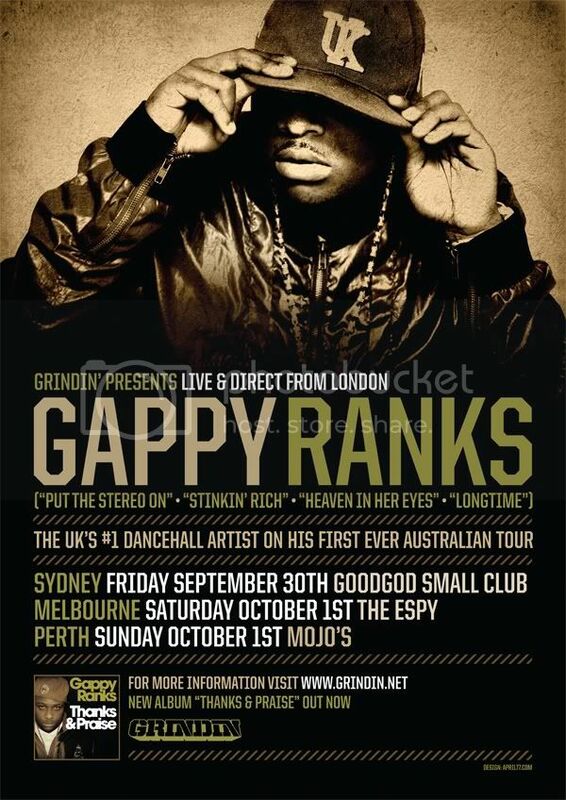 yo melbourne massive show gappy dat ya love reggae and ya can put on a professional ting. Yo Cuphead Gappy was performing at Good Gods first bday not a reggae night. Lots of reggae was played throughout de night, Firehouse was playing reggae in de front room. I heard Jimmy Sing playing dancehall etc. It was a celebration fe one of de few good and versatile clubs in Sydney. Oh an Happy Birthday Good God!